I’m a big green smoothie fan and am always looking for new ways to keep my blends interesting. Lately, I’ve been loving the addition of fennel as it gives them a very mild anise flavour, not to mention a heap of extra fibre! 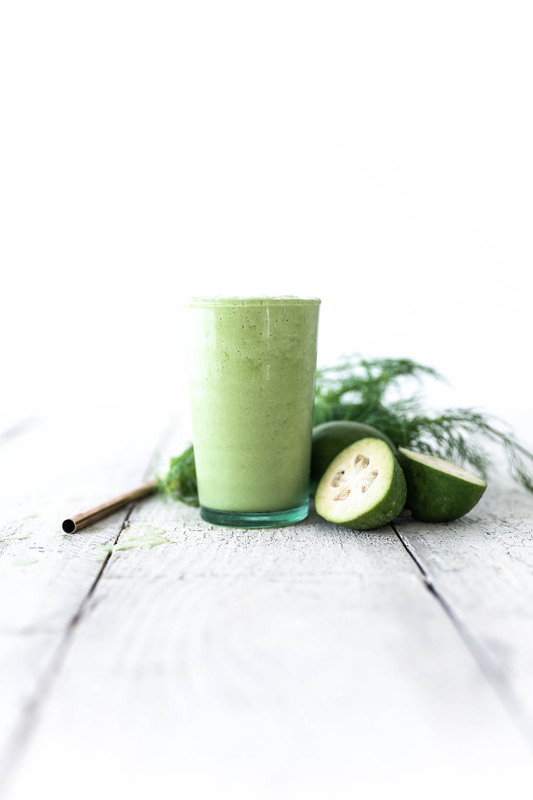 When feijoa’s came into season it made perfect sense to combine the two, and the resulting smoothie was so delicious it definitely needed it’s own blog post! For those who haven’t come across a feijoa before (also known as pineapple guava or guavasteen), it has a smooth green skin and is about the size of a kiwi fruit. It has a creamy coloured inside with a similar in texture to a pear, but with jelly bits (sounds weird but it’s the best way to describe them!). Feijoa’s also have a very unique, fragrant flavour, which has been described as a cross between a pineapple and guava. Fennel on the other hand is quite the opposite. It’s actually a herb, and a member of the carrot family. It has a mild but distinctive licorice flavour and fragrance. Strangely enough, these two opposite ingredients create the most beautifully fragrant, green smoothie! Now, if you’re unfortunate to be living in a country that doesn’t have feijoa’s, (and I know that’s most of them as they’re rather unique to New Zealand! ), then don’t despair! This green smoothie still works if you leave the feijoa out, or swap it for a little fresh pineapple. Feijoa’s are a great source of dietary fibre, packed with vitamin C, and are very low in calories. 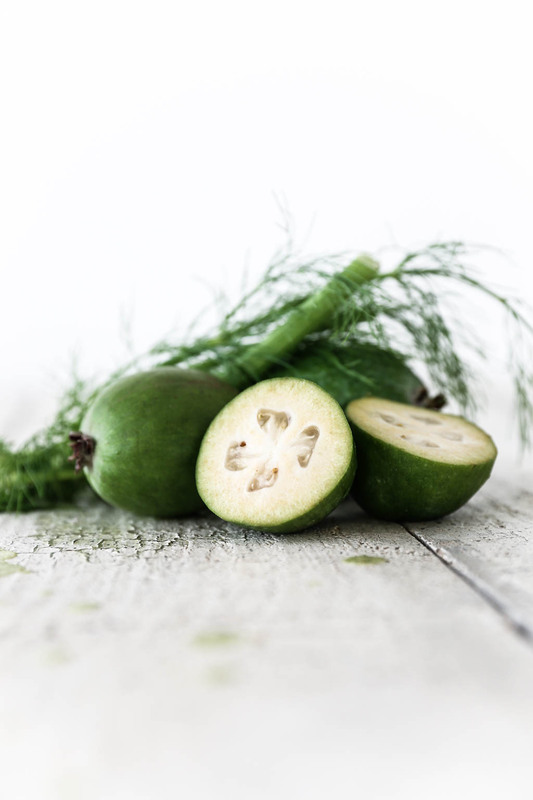 Fennel is also a great source of fibre, potassium and vitamin C, so together these two ingredients are amazing for your digestion, your skin, and reducing inflammation. 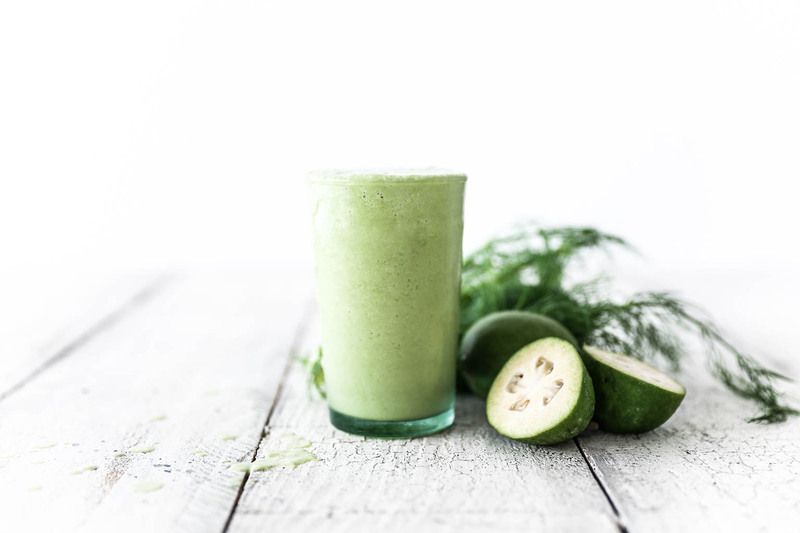 If you want to know more about why green smoothies are so good for you, check out this green smoothie post here or the 5 Day Green Smoothie Challenge here! 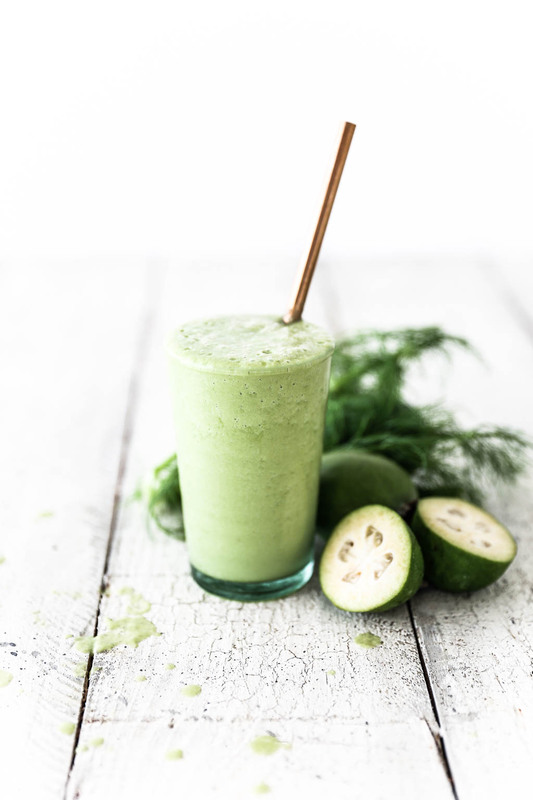 I hope you enjoy this fragrant green smoothie recipe, and you have any comments, additions or tweaks you’d like to share, or just to tell me whether you liked it or not, leave a comment down below! Enjoy. Wash the spinach leaves well and leave to drain. Wash the fennel well and chop in half if required. Peel the lemon and apple (if not organic) and place in the blender jug along with the spinach and fennel. Cut the feijoa in half, scoop out the flesh and add to the blender jug. Lastly, wash and peel the ginger (if not organic) and add to the blender along with the yoghurt, water and ice cubes. Blend on high until all the ingredients are well blended and smooth. Pour the smoothie into a glass and enjoy. This smoothie will keep in a sealed jar or bottle in the fridge for up to 3 days. OMG I spent 9 months in NZ in a house with 3 feijoa trees. They were SO good! Unfortunately I’ve never been able to find them in the US.